Paul Brown: Short tenure but long influence. At Ohio State, a head football coach seldom has the opportunity to leave the job on his own terms. Even the two most accomplished OSU coaches, Woody Hayes and Jim Tressel, ended their respective tenures with a firing and a forced resignation. Urban Meyer's mentor Earle Bruce was unceremoniously dumped on the Monday before his last Michigan game. By today's standards, Tressel actually had a pretty good run at Ohio State by coaching for 10 years. His immediate predecessor, John Cooper, managed to last for 13 seasons, while Bruce coached for 9. And of course, Hayes set the record for longevity as OSU head coach with his 28 marvelous years. But prior to that, there was a period of upheaval in the position caused by some unforeseen circumstances both within and outside of the Ohio State program. Brown's first OSU team finished 6-1-1 and managed to tie Michigan, both on the field 20-20 and in the Big Ten standings in 2nd place (Minnesota won the conference). His 1942 team was good enough to win Ohio State's first national championship in football. But events beyond the gridiron were developing that would put a stop to the budding football dynasty that Brown was building. Late in 1941, the United States was drawn into World War II. The war did not have an especially large impact on the 1942 season, but the effect on the 1943 season was devastating. Many young men from all over the country enlisted in the war effort and most football programs were left with few if any players with any kind of experience to fill out their teams. As a result, there were many schools that simply suspended the football program until the war was over. Football at Ohio State carried on, but Brown's team had been decimated by players leaving for the war and his 1943 squad struggled to post a disappointing 3-6 record. After the season, Brown himself volunteered for service and was granted a commission in the Navy, where he was immediately appointed the coach of the "Bluejacket" team representing the Navy's Great Lakes training center. As he left, Brown appointed one of his "position coaches" (which is how he referred to his assistants), Carroll Widdoes, to replace him as head coach, and the OSU top brass approved his appointment. Brown pledged to return to Ohio State after his war service, and so Widdoes technically was considered the "acting" coach of the team. Widdoes seemed an unlikely candidate for the position. Not only had he never been a head coach in college before, he had not even coached at the high school level. Widdoes was the soft-spoken son of a Christian missionary who had played football for the first time when he attended Otterbein College in the '20's. After that, he coached at the Junior High level in Massillon before joining Brown as an assistant. Like Brown, Widdoes was extremely organized and his particular specialty was teaching good blocking techniques. Widdoes' first OSU squad was an outstanding team, despite the fact that 31 of its 44 members were freshmen. They swept the Big Ten and even defeated Brown's Great Lakes team 26-6. Senior Les Horvath, who was granted an extra year of eligibility due to the war and the fact that he was attending dental school, became the first OSU player to win the coveted Heisman Trophy, beating out Army's legendary backs Doc Blanchard and Glenn Davis. Ohio State was awarded the title "National Civilian Champions" as they finished 2nd in the polls to Army, and Widdoes was named national coach of the year. 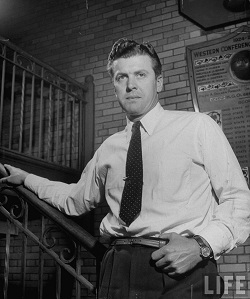 In February of 1945, Brown changed his mind about coming back to Ohio State as he made an agreement with Cleveland businessman Arthur McBride to become the head coach of a new entry in the professional football ranks. That team eventually became the Cleveland Browns, and as we all now know Paul Brown went on to become one of the best, if not the best, coaches in professional football history. But his decision left Ohio State with an "acting" coach and some doubts about the future of the program. Wes Fesler: A man for all seasons, and all sports. OSU officials made Widdoes the permanent head coach, and he coached the 1945 team to a 7-2 record and 3rd place in the Big Ten. But Widdoes was not happy having the limelight, and he preferred spending time with his family to the rigors of being head of a big-time college football program. So he asked if he could go back to being an assistant coach, and the university obliged by swapping him and making current assistant Paul Bixler the new head coach. Bixler was a Mt. Union grad who had coached at Canton McKinley and Akron University before joining Brown at OSU in 1941. He was a likeable man, and Brown had hoped to add him to his staff in Cleveland before the switch. His 1946 Buckeye squad was fairly solid for most of the season, but after starting out 4-1-2, they lost their last two games of the season including a 58-6 drubbing at home against Michigan. Bixler's team was affected by the fact that several key players who had come back from war service decided not to return to OSU but instead signed contracts to play for Brown in Cleveland. Citing the high pressure of the job as his reason, Bixler resigned after the season and went on to become the head coach at tiny Colgate University in Hamilton, NY. Attendance during the 1946 season had averaged over 70,000 for the first time ever, and attention on the OSU program was higher than it had ever been. Bixler coached at Colgate for 5 years before departing to join, you guessed it, Paul Brown as an assistant coach with the Cleveland Browns. Brown's shadow continued to darken his old stomping grounds, turning it into what many sportswriters called "the graveyard of coaches". While the Ohio House of Representatives passed a resolution suggesting that Ohio State should ask Brown if he was willing to come back and coach the Buckeyes, athletic director Lynn St. John hired former football star Wes Fesler to become OSU's 5th head coach in an 8-year span. Fesler had been a 3-time All-American football player at Ohio State from 1928-1930, and also starred in baseball and basketball for the Buckeyes. He was an ideal candidate for the job, having strong Ohio roots and having already coached at Wesleyan University and the University of Pittsburgh. 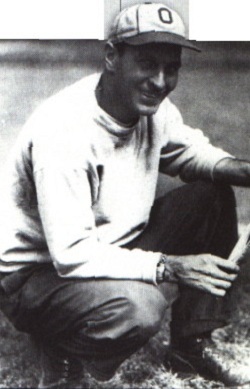 Fesler found the early going difficult in the post-war Big Ten. His 1947 team finished dead last in the conference (for the only time in school history) and posted a record of 2-6-1. His team struggled to adjust to a new system, since he was the first coach since Brown left that had not been an assistant under Brown. His 1948 team fared much better, finishing in 4th place in the Big Ten and posting a 6-3 record. But they lost to Michigan 13-3, putting a damper on the finish. 1949 was even better, as Fesler's Buckeyes won a share of the Big Ten title. Even a 7-7 tie against Michigan failed to stop the team's momentum, and they represented the conference well in Pasadena, winning the Rose Bowl 17-14 over California. But Fesler was starting to crack under the pressure. He nearly resigned after the season, but university officials lured him back with the promise that they would grant him a teaching position when he decided to retire from coaching. The 1950 season would be a rebuilding year, and it would take its toll on the coach and the program. The Buckeyes stumbled out of the gate with a 32-27 loss to SMU. But after that they reeled off 6 straight wins, and it appeared that Fesler was on top of his game. OSU headed into a road game against Illinois ranked #1 in the nation. But that is where it all began to fall apart. The Buckeyes came out sloppy against the Illini, and eventually threw 3 interceptions while losing 4 fumbles. Illinois did not turn the ball over at all, and they cruised to a 14-7 win. Even after the game, Ohio State was in a position to win the Big Ten if they could win a home game against Michigan the next Saturday. The weather forecast for that day called for snow, but no one was prepared for what actually ensued. A severe blizzard engulfed central Ohio that day, including 5 inches of snow and 30-MPH winds. Incredibly, OSU and UM officials decided to play the game anyway, and the two teams struggled through a comedy of errors that included a combined 45 punts. In the end, Michigan emerged with a bizarre 9-3 victory. OSU had taken a 3-0 lead on a remarkable 28-yard field goal by eventual Heisman Trophy winner Vic Janowicz into the teeth of the wind. But later the Wolverines blocked a Janowicz punt for a safety to cut the lead to 3-2. The Buckeyes still had that lead when Fesler ordered Janowicz to punt again on 3rd down with 47 seconds remaining in the first half. UM's Tony Momsen blocked the punt and fell on it in the end zone for the game's only TD. Neither team scored in the 2nd half, and Fesler's decision would be highly criticized by OSU partisans everywhere. The "Snow Bowl" would be remembered for all time, but mostly in a bad way for Ohio State fans. Fesler resigned after the 6-3 season, feeling that the pressure of the job was too much for him and for his family. He would initially enter the real estate business, but eventually landed the head coaching job at Minnesota. Meanwhile, Ohio State would turn to a mostly unknown coach named Wayne Woodrow "Woody" Hayes to take over their program in 1951. The rest, of course, is history. Hayes' 28-year run as OSU coach put an end to all the "graveyard of coaches" talk forever. It is still a high-pressure job, but for now stability seems to be the rule and not the exception. 1 Hall of Fame, stadium named after you, inventor of the playbook, the facemask, and the draw play. Not bad.